We are committed to having the finest quality plants and service provided in a beautiful and relaxing atmosphere. 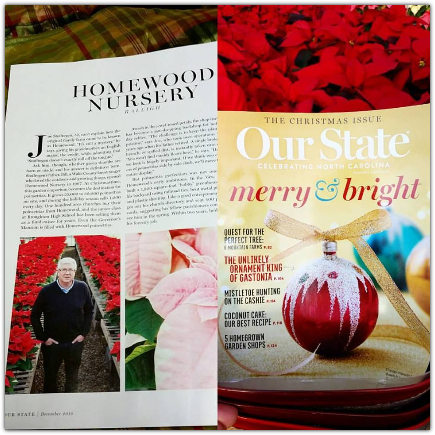 Homewood is recognized as a leader in the horticulture industry and has been featured in local, state, and national publications. Homewood's unique combination of over 4 acres of greenhouses, garden center, and outdoor nursery department and the high quality of service and plants are what keep Homewood on top. 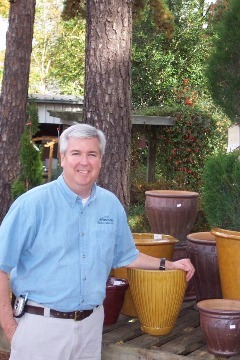 As one industry expert put it, Homewood "is a classic family retailer/grower/garden center." The greenhouses and nursery area are regularly toured by university horticulture classes and has been a learning ground for many students. Forty-nine years. 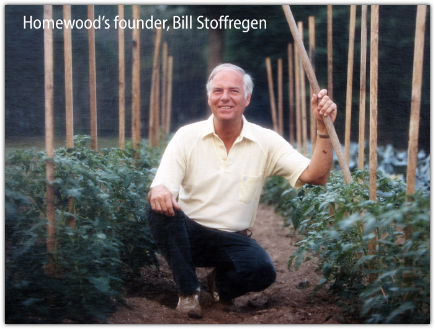 That's how long it's been since my father, Homewood's founder, Bill Stoffregen first built a 19' x 100' greenhouse in his backyard at my family's home located at 4700 Six Forks Road in 1967. To support his venture, Bill sent out postcards to his neighbors and friends from church letting them know he would probably be growing more than he could use and would love to sell the rest. Not long after, while doing his full-time job as the Wake County forest ranger, Bill found a beautiful piece of land on Honeycutt Road which he purchased for $1500(!) an acre. At the time, he had no idea that in 10 short years he would pull up roots and relocate his family and business to what most people at the time considered to be a remote part of northern Wake County. He believed the future of Homewood would be in wholesale, growing and selling to other garden centers and florists in the burgeoning Triangle area. Even though he was rapidly expanding the greenhouses and growing facility, Bill said, at the time, "Retail never crossed my mind." But retail was on the mind of many people as they relocated to north Raleigh, and word of the nursery spread as they found themselves drawn to the pastoral setting of Homewood. As Raleigh mushroomed, Homewood grew beyond being just greenhouses, adding a nursery area under the pine trees, a unique atrium for the garden center, and a gift and floral shop. ​Landvision Designs was also invited to join us adding a full service landscape company to our site. Always, as we built and added to Homewood, Bill reminded us that this was also his home and that we "better keep it pretty" since it is still his backyard. That feeling of home and appreciation of beauty is what we all experience here today. Forty-nine years of being rooted in Raleigh, a foundation from which will come many more years of growing relationships with our customers and sharing our passion for plants.